Until very recently, if you knew the Mileage Plus number and last name of a United customer, you would have been able to reset their frequent flyer account password simply by guessing the multiple-choice answer to two secret questions about the customer. However, United has since added a third step — requiring the customer to click a link in an email that gets generated when someone successfully guesses the multiple-choice answers to the two secret questions. It’s crazy how many people post pictures of their boarding pass on various social networking sites, often before and/or during their existing trip. 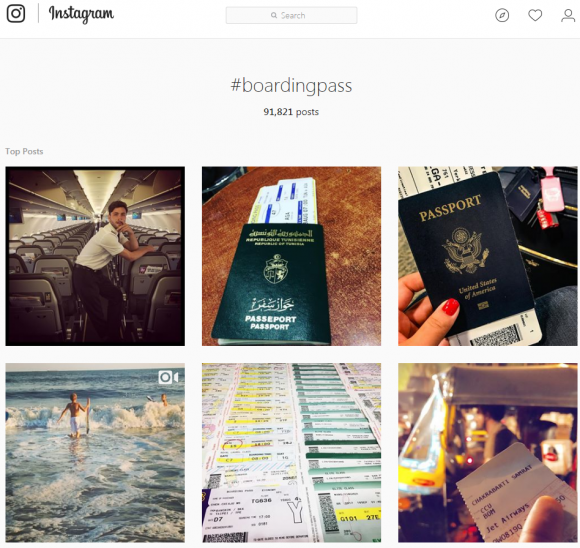 A search on Instagram for the term “boarding pass”, for example, returned more than 91,000 such images. Not all of those images include the full barcode or boarding record locator, but plenty enough do and that’s just one social network. For anyone interested in how much of today’s airline industry still relies on security by obscurity, check out this excellent talk from last year’s Chaos Communication Congress (CCC) in Berlin by security researchers Karsten Nohl and Nemanja Nikodijevic. Nohl notes that the six digit booking code or PNR is essentially a temporary password issued by airlines that is then summarily printed on all luggage tags and inside all boarding pass barcodes. In his talk, Nohl showed how these PNRs are used in code-sharing agreements between and among airlines, meaning that gaining access to someone else’s frequent flyer account may reveal information associated with that customer’s accounts at other airlines. Nohl and his co-presenter also demonstrated how some third-party travel sites do little to prevent automated programs from rapidly submitting the same last name and changing the PNR, essentially letting an attacker brute-force a targeted customer’s PNR. My advice: Avoid the temptation to brag online about that upcoming trip or vacation. Thieves looking to rob someone in your area will be delighted to see this kind of information posted online. Don’t post online pictures of your boarding pass or anything else with a barcode in it (e.g., there are currently 42,000 search results on Instagram for “concert tickets”). Finally, avoid leaving your boarding pass in the trash at the airport or tucked into that seat-back pocket in front of you before deplaning. Instead, bring it home and shred it. Better still, don’t get a paper boarding pass at all (use a mobile). This entry was posted on Thursday, August 24th, 2017 at 6:55 pm	and is filed under Other. You can follow any comments to this entry through the RSS 2.0 feed. Both comments and pings are currently closed. I recommend to keep the boarding pass in your documents instead of shredding it. From time to time, class actions are authorized against airlines and the boarding pass makes it simpler to prove that you took a flight with the airline at a certain date. I go as far as tearing off the label from checked baggage and shredding that as well.. I leave no traces behind.. Some shredders don’t like the sticky stuff on peel-off backings. So, stick it to another paper first. Better yet, keep a box of things to be burnt. The shredder may not like the paper type or adhesives, but the papers and adhesives all love a good bonfire once it gets going. I find a very sharp pair of scissors will chop up every adhesive label that I have ever encountered. Yes, it takes some effort compared to “drop it in a shredder”, but if you chopped it up by hand you know how well you destroyed the original. Heck, you can even “crosscut” the remaining bits as much as you want/can and then know with some certainty that only a seriously determined identity thief with lots of time on their hands could reassemble it from the trash bin(s). Brian, you briefly mention certain sensitive information is also encoded on luggage tags, but don’t specifically mention a recommendation for secure disposal. Any clarification you can share? Ps – thanks for years of informative reporting. You are by far my preferred source for novice understandable infosec information. It can be summed up in one line–Follow hygenic internet practices! If it is about paper and ink then use your phone. Excellent article and reminders bout personal Opsec. I tweeted this out – hope that is ok.
Re final sentence “…. Better still, don’t get a paper boarding pass at all (use a mobile)….” I saw a very distressed American lady in Heraklion Airport (Crete, Greece) last month whose phone wasn’t working so she couldn’t display her boarding pass, so she was denied boarding. I print out all my Boarding Passes & Visas at least 24 hours before travelling in case my ISP is down or my Printer breaks. Leave nothing to chance. Agreed. I do the same. Simply take a screenshot of your boarding pass. Solves the no ISP/Internet connection issue. Also with proper ID, any gate agent can print a copy of your boarding pass for you. Don’t miss the trees for the forest. Apparently you’ve never traveled in the Second or Third World. In some locations, this is the golden bribe extraction opportunity against the “rich westerner” who can afford planes AND an iPhone. The larger point being made by others here is to think about your situation individually, and not be overly reliant on your mindless game and social media device. “PNR is essentially a temporary password” – if it’s temporary, when does it expire? The boarding passes that people post are mostly for completed flights. The PNR should be expired for completed flights. If it’s not expired promptly, I don’t understand why. The PNR is the actual complete reservation, not the code. The six digit code is the record locator which is what is used to actually LOCATE the reservation. The PNR can actually expire the day after travel is complete, however a lot of travel agencies add a retention line to keep the PNR live for a set length of time after travel (sometimes up to 6 months) to make it easier to look at in case of a customer service issue. Yes, let’s keep our boarding pass private. Great recommendation, Krebs! Public access to a computer system’s data should require more than a simple QR code. This should be a two step process. (1) Authenticate with the computer with a user id, password, pin, etc.. (2) share data quickly using the QR code. The QR code should contain nothing more than a pointer to a database record. Without access to the database, the code is useless. Bar Codes and QR Codes should only contain public data. Any private data must be stored in a secure database that would require authentication to access the data. The QR Code can contain a pointer to the database record. This is a best practice. Perhaps someone should teach the airlines. An interesting idea and good recommendation under other circumstances, however, can you imagine the time the boarding process would take if every person had to enter their user credentials after scanning their boarding pass at the gate? Many people are severely technically challenged by the POS at the grocery store and ATMs, and you are suggesting that you add an authentication step to the already minimally functional boarding process to get on a plane. I agree that something should change, but a better implementation would need to be considered. I read Tony’s response to mean, the QR/bar code should only mean something when scanned by the airline’s own computer. An independent QR scanner on my cell phone wouldn’t have access to the airline’s DB, and in turn I’d get no usable information from decoding it. Why don’t airlines print “For privacy concerns, do no post your boarding passes on internet” on the boarding passes? This would be a short term solution before they modify barcodes/QR codes to remove sensitive information from them. * Redress number, (if previously given to the passenger by the US authorities). * All available payment/billing information. Ref.-1: Wikipedia page for “Passenger Name Record”. Until people stop bragging their flights to a (less) successful mates, there will be still a lot of room for various nasty things like identity theft. Unluckily, websites like Instagram or Facebook dont discourage this “social unsocialness”. It’s actually a nice and useful piece of information. I am satisfied that you simply shared this useful info with us. I keep my boarding passes and shred them at work. With the luggage tags, I tend to rip them into several pieces which I keep in my pocket and then gradually dispose of them in different bins as I move around through the day. I take all my boarding passes home along with all baggage tags and stickers. I then incinerate them in an industrial furnace at 2000 degrees Celsius. I then take the ashes from the furnace and encase them in concrete. Following this put the concrete block in a boat and travel at least 12 nautical miles off the coast. I then drop the block in the water – but only when it’s 300 feet deep. I also make sure to leave my phone and EPIRB on-shore. This removes any chance of being tracked by GPS.